Xuni provides simple and easy-to-use controls for visualizing and editing user data. One area that we haven't explored too much yet is saving to and loading from some type of external source. We’ve touched on this somewhat in our webcasts for Xuni for Android (as well as Xuni for iOS) with regards to loading data from a web request, but we haven't worked with data coming from a local source. In this article, we'll examine loading data from and saving data to a local CSV file on the Android platform using Xuni FlexGrid. I’ve chosen to focus on the CSV format for several reasons. First, this is a common format between many applications, and, perhaps most importantly, spreadsheet applications like Excel and Google Sheets. Thus it’s relatively easy to export data into this format and import it elsewhere. These files are also conceptually very easy to work with, and make for a good instructional tool since they’re easy to read. 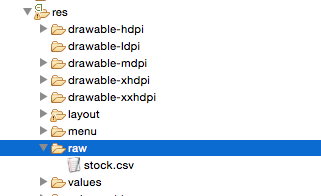 This example uses some stock data that has been saved into a CSV. We'll deal with loading the data from a CSV saved as an internal raw resource, optionally loading from external storage, and saving to external storage. The first step to implementing our example is to create a class that handles reading a CSV file and parsing the data. The basic construction will be to package the file data into an InputStream; use a BufferedReader to grab the data line by line as we iterate through it; and split the incoming lines into string arrays. When we've finished iterating through the CSV we'll be left with an arrayList containing String arrays that represent each line. At this point we've created something very generic, but we can create another class to act as our model that more strongly represents the data we'll be working with. The next step for our project is to create a model where we can strongly type our data (rather than treat every value generically as a string). Creating another class to act as a model gives us an opportunity to parse the Strings into data types that better reflect the values. 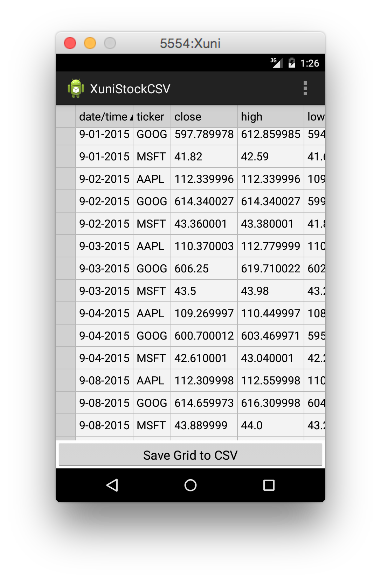 A single line of the stock.csv file looks like this: GOOG,01-Sep-2015,602.359985,612.859985,594.099976,597.789978,3680200 These values reflect a ticker, date, open, high, low, close, and volume, which means we'll need to create properties that correspond to each. We'll also create a method for parsing a List of string arrays into an ObservableCollection of StockData objects so that we can set it as the FlexGrid's itemsSource. Likewise, we'll provide a mechanism for taking the ObservableCollection after it's been edited with the FlexGrid and converting it back into a List of string arrays for the purpose of saving the data to disk. Xuni FlexGrid is perfect for visualizing the type of data normally contained in CSV files, and CSVs provide a quick, common avenue for sharing information. The Android platform offers a lot of flexibility in terms of saving and sharing information, so the three items together provide a very easy and open way of working with data. Xuni provides an easy way to visualize your data, and (as the above sample shows) can be a great mechanism for manipulating and editing as well.